and see the significant role Art plays in the library. Learn art history, visual literacy, and how to write about and look at art and much more. Does your job require you to be able to identify major artworks and artists, to understand visual literacy, to access the vast amount of art resources available? Are you someone who is responsible for sharing your knowledge with others? This online workshop will give you confidence in understanding the basics of art terminologies, an overview for looking at art, and identify major artists and styles. You will travel to world famous art museums virtually. You will have an opportunity to discover how to access the many art resources available to you so that you can share them with others. No prior art history or art knowledge required. Access at your convenience. You will be able to access the 4 week online class 24/7. The format is illustrated lecture/discussion forum/instructor attended. 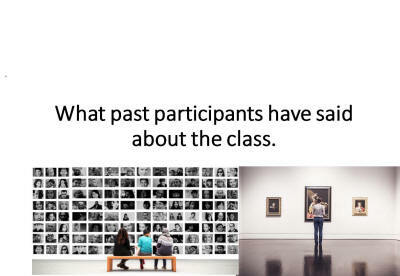 Week 1-This first week you will look at how to look at, talk about, and recognize major artworks. You will probably be surprised at how much you already know about Art and how much you will learn this week. This lesson will help you gain confidence in your ability to talk and recognize Art and its stylistic attributes. Week 2-You will travel the world and locally to find art in this fun and informative lecture. This lesson will help you in developing your knowledge of art and where to find it. Week 3-Resources, Resources, Resources. Where to find them. How to Use them. Share them. This lesson will help you locate important Art resources and tools that you can use and share with others. Week 4-Making your library Art friendly. You will discover how libraries are bringing Art into their space in innovative ways. Learn how to collaborate with your community and practical ways to make Art more accessible to your patrons. We will also look at librarians who are artists. 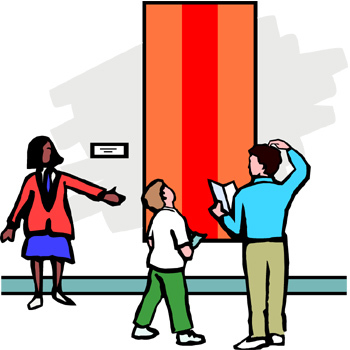 This lesson will help you set up programs and art exhibits in your library. This class has really opened my eyes in regards to really understanding and really appreciate all forms of art. After taking this class I feel confident; I have a better understanding of art and what makes a good composition and what elements to look for to better understand and talk about the work of art. The class also provided so many resources that I can use at work not just to assist others but also for me to continue learning about what art is all about. I am more confident in approaching a work of art realizing I have language I can use to describe it. I learned the importance of learning to speak using the terminology of the art world. I learned to remember that photography can be deceiving and to keep in mind it is easily manipulated to suit the purposes of the photographer. I learned to spend more time at museums contemplating selected pieces of art using the elements of design and learning to look hints. I was reminded to take advantage of all educational opportunities while visiting a museum whether that be chatting with the artist or curators, attending a lecture, docent tour, immersive experience, etc. The resources are extremely useful facilitating my continued growth and providing tools enabling me to talk comfortably with artists and museum curators, docents, etc. Thank you for creating this informative class! I learned a lot! Purchase Using Your Preferred Credit Card, or Pay Pal Using the Secured Website below. Library invoices accepted.